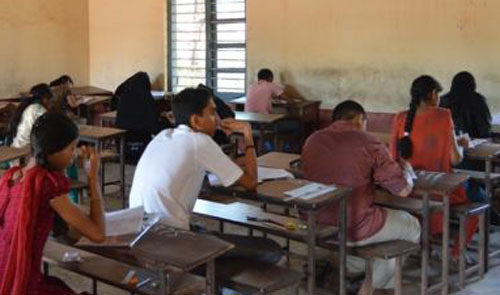 Bantwal, 23 Mar 2019 [Fik/News Sources]: A private unaided Kannada medium high school near here withheld registration for SSLC examination of four SSLC students with permission from their parents saying that the students lagged behind in studies. The parents of the students who have realized the gravity of the situation are regretting for their permission. The matter has given rise to many discussions. The teachers had spoken about it to the parents when the students were in ninth standard. They had promoted the students from ninth standard and explained to the parents that the students will have to inevitably spend two years in SSLC. The teachers had refrained from registering the names of four students during registration for SSLC examination hall tickets in October, last year. The names of other 29 students were registered. There are allegations that the students were left out to achieve better percentage of results in the examinations. Bantwal education officer Shivaprakash rushed to the school on Friday soon after he received the information. He gathered details from school teachers and parents of students and said that a notice will be issued to the school asking to submit detailed report within 24 hours. Shivaprakash said that depriving students from examination for better results is not correct. “Suitable action will be taken against the school,” he said.